The western culture, having christianity as its matrix, has been suffered by side effect of materialism with the progress of civilization these days. Accordingly, people become interested in something spiritual and the inner world more and more. Likewise, they also has been concerned about Buddhism which regards the true-self and true-nature as important. Especially, the conception of Zen is very popular to westerners, and the word of ‘zen’ is used in a various field already. Many people in western culture would like to learn what is zen and how to study it. The great Zen Masters of Korean have visited to western world like the United States to teach the Korean Son(Zen in Korean) in 1970s. Since then the Korean Buddhism and its wisdom remain in existence until now. 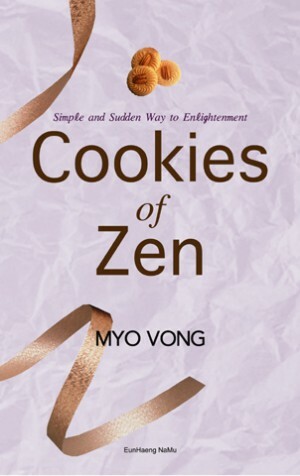 Among them, Master Myo-Vong who opened several temples and shrine in America has published his new book Cookies of Zen for the westerners who are interested in Zen but hardly know how to study it. Cookies of Zen has most important teachings and talks of Hye-Am, the Venerable Master in Korea who also had visited to U.S. with Myo-Vong, Pojo, the founder Korean Son in the 9th century, Kyung-Ho, the great master who cultivated Korean Modern Buddhism, Boddhidharma or Dhama the initiator of Chinese Ch’an (Zen) and the author Myo-Vong. These grand masters give lessons on the basis of what is Hwa-Du (Catechism) and how to study it, and enlighten the readers with various Hwa-Dus directly. Read the Hwa-Du and meditate, then read the comments of great masters. The wisdom of this book make people attain spiritual enlightenment not only whom believe in Buddhism but also non-believer even the christians. You could have a chance for being deeply moved and self-reflected. As you could catch from the tile ‘cookies of zen,’ this book is written easy and comfortable so that westerners who aren’t familiar the concept of the oriental religion. Nevertheless, Cookes of Zen is not a kind of book you could throw it after quick reading. It is a guide for emancipation and workbook for the practice of mind, the spiritual training. The wisdom Master Myo-Vong explained is simple but profound at the same time. You read this book again and again, listen the question from you deep mind continually. Then finally you could be spiritually awakened and find your own Buddha in your inner world. Master Shin, Myo-Vong was born in Korea in 1943. During difficult times, he excelled academically and ascended to become professor of philosophy at Dong-guk University. In 1966, Master Myo-Vong received the Tao from Venerable Master Deok-San and, at the Venerable Master’s suggestion, he came to the United Stated in 1975. He opened several temples and shrines in California, Texas, Alabama and Maryland, and introduced ancient Buddist mind cultivation practive to Westerners. 물질이 중요시 되는 현대사회에 이르러 서양에서는 정신적인 것, 내면의 문제에 대한 관심이 폭발적으로 증가하고 있다. 종교적인 면에서도 많은 서구인들이 서구문화의 뿌리라 할 수 있는 기독교외에 자아와 만물의 본질을 중시하는 불교의 진리에 깊이 매료되어, 불교의 선(禪)에 대해 알고자 하는 이들이 늘어나고 있다. 1970년부터 한국의 고명한 선승들이 이미 이러한 서구인들의 깨달음에 대한 갈증과 배움에 대한 갈망을 익히 알고 미국 등 서양을 방문하여 그곳에서 한국 불교의 가르침을 전하기도 했으며, 그 명맥이 지금까지도 이어지고 있다. 그 가운데 미국으로 건너가 미국 여러 지역에 사찰과 암자를 짓고 수많은 사람들에게 부처의 진리를 설파한 묘봉 스님이 보다 많은 외국인들에게 불교와 특히 “선”에 대한 가르침을 전하기 위한 방편으로 새로이 준비한 선물이 [Cookies of Zen]이다. 외국인에게는 막연하고 어렵게만 여겨질 수 있는 선에 대한 쉬운 접근을 위한 안내서인 [Cookies of Zen]은 수덕사 조실이었던 혜암 큰스님과 신라 시대 선종을 편 보조(體澄), 한국 근현대 불교를 개창한 대선사인 경허(鏡虛), 중국 선종의 창시자인 달마대사 그리고 저자인 묘봉의 주요한 가르침을 담고 있다. 책 속의 위대한 선승들은 독자에게 화두가 무엇이며 이를 어떻게 공부해야 하는가 하는 기초적인 가르침을 시작으로 여러 화두들을 직접 제시하고 그 안에 담긴 뜻은 무엇인지 세세히 알려준다. 수많은 화두를 읽고 그에 대한 큰스님들의 설명을 함께 접한 후 명상함으로 “선”의 가르침들은 단지 불도들에게만 깨달음을 주는 데 그치지 않고, 다른 종교를 가진 사람이나 아무 종교에도 속해 있지 않은 이들에게도 큰 감명과 자아성찰의 기회를 선사한다. “선 쿠키”라는 뜻의 제목에서도 알 수 있듯이 이 책은 외국인들에게는 낯선 종교인 불교의 “선” 사상을 이해하기 쉽도록 편안하게 쓰였지만, 가볍게 읽고 내려놓을 책은 결코 아니다. 독자에게 이 책은 해탈의 안내서이며, 마음 수양을 위한 워크북이기도 하다. 저자가 풀어난 심원한 지혜는 이해하기 쉽지만 또한 그 깊이가 매우 깊다. 여러 차례 반복하며 음미하다보면, 마음으로 끊임없이 내면에서 의문이 떠오를 것이며 이 질문들은 누구나 자기 내면에 간직하고 있는 부처의 심성을 깨닫는데 핵심적인 역할을 할 것이다. 속성은 신. 1943년 한국에서 태어났으며, 어려운 시기에 학업에 정진하였다. 이후 동국대학교 철학과 교수를 역임하였다. 1966년 덕산 스님을 통해 도를 깨달았다. 1975년 스승의 뜻에 따라 미국으로 건너가 캘리포니아, 텍사스, 메릴랜드 등지에 여러 개의 사찰과 암자를 세우고 서양에 불교의 가르침을 전파했다.